When completing technical and Engineering drawings it is usual to use standard sizes of paper. packaging work for Product design or Graphics it is important to use card and paper sizes efficiently. ‘NETS’ - the flat folder shape that makes up 3-D packaging, must be designed in the context of a whole piece of paper with the minimum of wastage. Place one NET shape and then see how many more can be fitted around it. Small additional pieces that are to be used elsewhere in pack designs can often be taken from areas that are left in-between sections used by the NETS them-selves - areas that would otherwise be wasted. 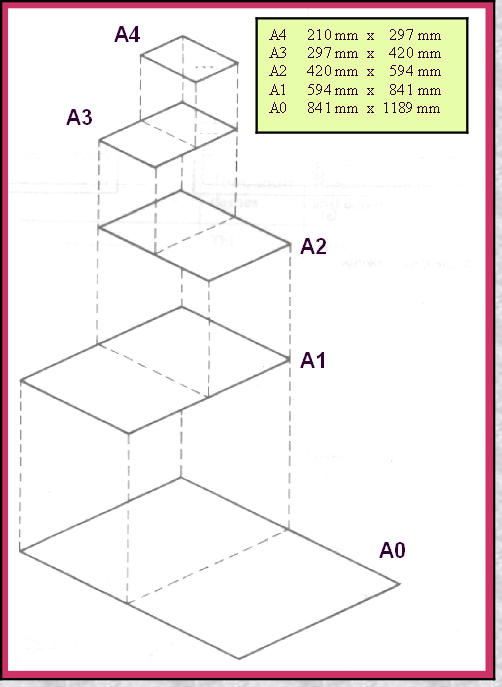 Looking at the illustration shown here it should clear that each ‘reducing’ size takes the measurement of its longest side from the preceding ISO size’s shortest size.… and ... Its other dimension is the previous piece’s shortest side !!! It sounds complicated but once you have seen the relationship you should be able to work out all the sizes from simply having to hand a piece of A4 paper.